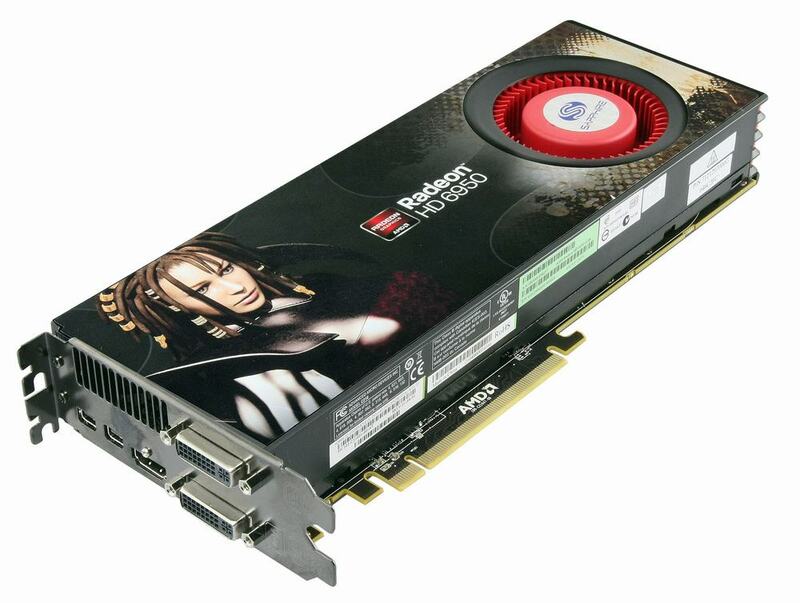 Almost the same time new Radeon HD 6900 series cards were introduced, it was discovered that Radeon HD 6950 2GB has the potential to become almost full-fledged Radeon HD 6970 2GB. 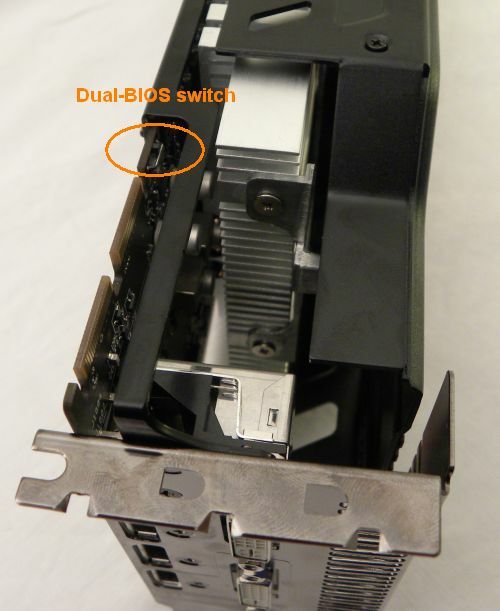 Both models have identical design, excluding memory chips and one supplementary power connector. HD 6950 graphic cards of reference design have Hynix memory chips labeled H5GQ2H24MFR 2T with specified clock of 1250 MHz (QDR 5000 MHz), while reference HD 6970 cards are equipped with H5GQ2H24MFR R0 chips that can safely run at 1500 MHz (QDR 6000 MHz). 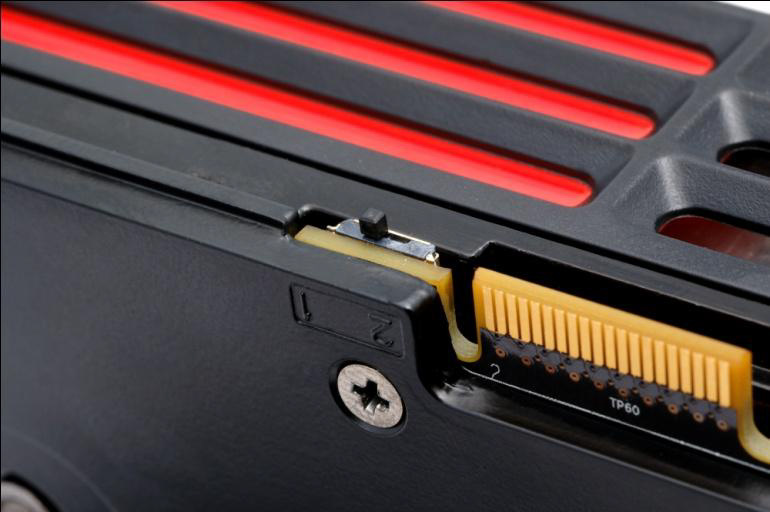 The first card requires two 6-pin power connectors (75+75W) whereas Radeon HD 6970 need one 6-pin and one 8-pin power connector (75+150W). For BIOS change it is required to set the switch to position “1” in order to flash the cards safely — in case of a failure, you can always start the card with default settings by moving the BIOS switch to the position“2”. 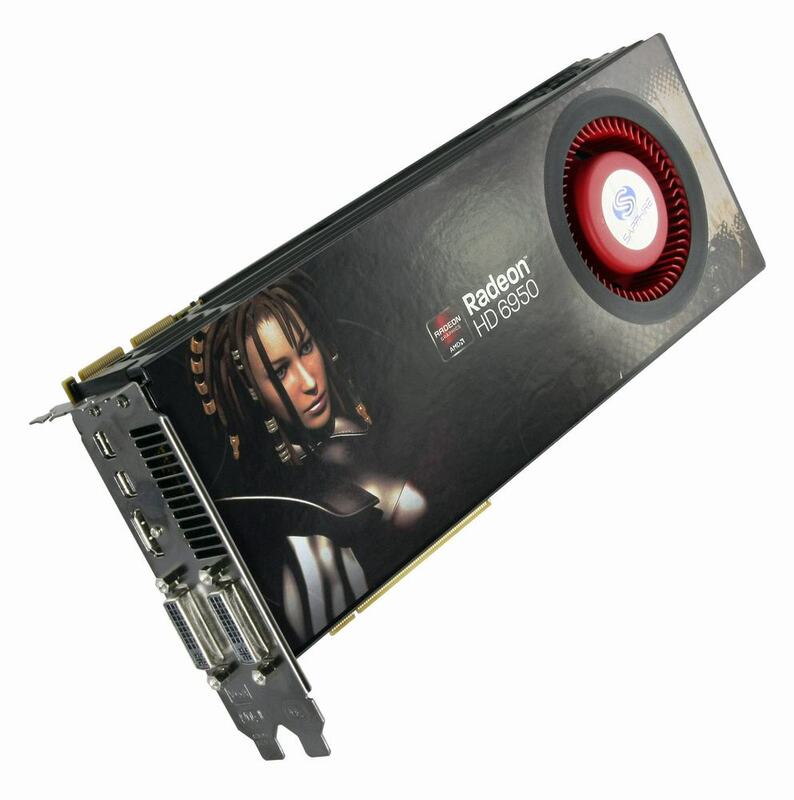 We confirm successful unlocking on references design Radeon HD 6950 2GB cards only. Neither this website, nor authors of tools used for this test/review accept responsibility for the actions done at your own risk. If you decided to take a chance, then we recommend you to avoid using letters and symbols different from Latin for file paths. Follow the request and restart PC. The number of Steam Processors (SP) has changed from 1408 to 1536, and clocks increased from 800/1250 MHz to 880/1375 MHz, which correspond to default specs of Radeon HD 6970. However, this unlocking method has one major drawback — you can not change GPU voltage using different overclocking tools. It was not acceptable for us, so we used a help of a different flashing tool — Mod_BIOS_HD_6950. 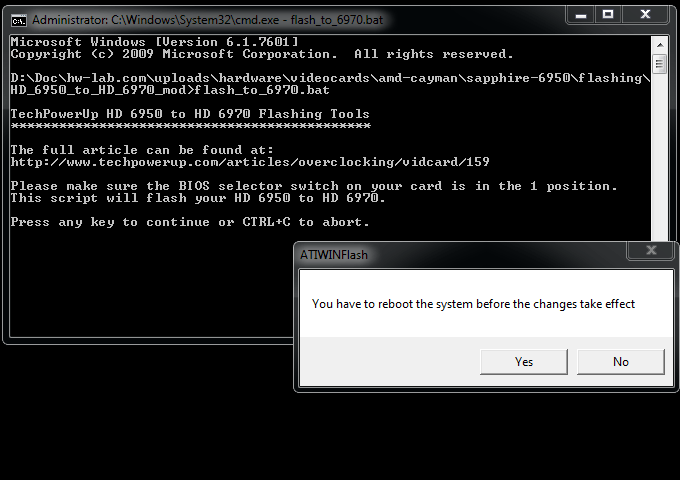 The tool patches the BIOS of Radeon HD 6950 cards by changing the performance configuration only. This tool was created by a well-known, among hardware enthusiasts, person W1zzard. This man has put a lot of effort for development of overclocking community. He is the one responsible for creating tools like GPU-z and many more. 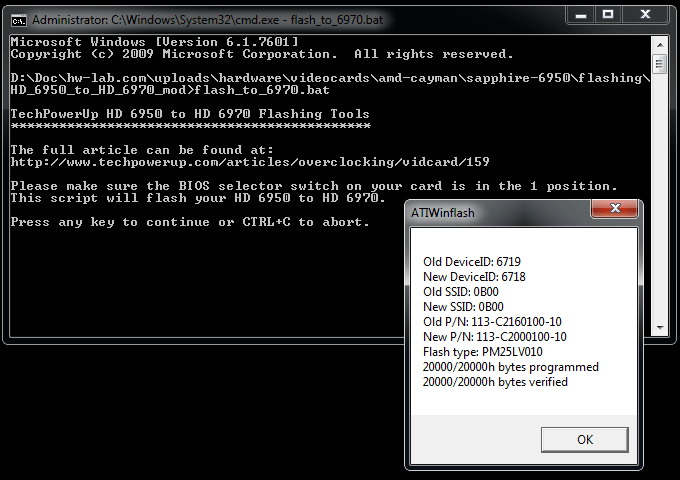 And now, W1zzard has presented yet another useful tool..
Advanced users will have no trouble to flash the cards with a patched BIOS. As for newbies — better use the HD 6950 to HD 6970 Flashing Tools tool that was described above. 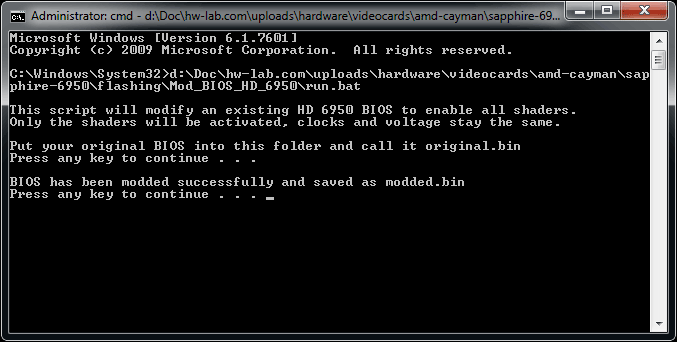 You need to rename patched BIOS file to unlock.bin and copy it to winflash folder, overwriting the existing one. 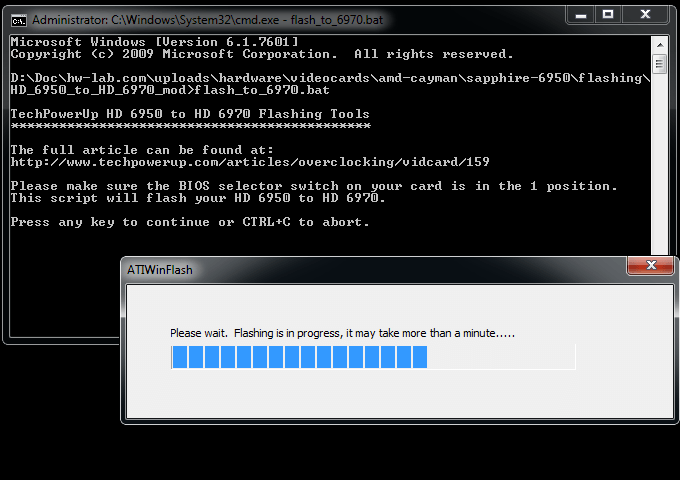 Launch flash_to_6970.bat file and wait for process to complete, then restart your PC. Next step is to check voltage levels and temperature values of the card. I picked up a Saphhire HD 6950 today. The one with dual fans and dual bios. I was happy when I switched to the secondary bios and found the shaders unlocked. No flash necessary.